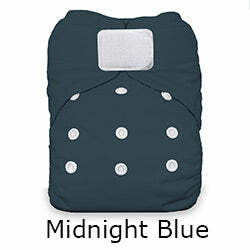 Thirsties Natural One-Size All-in-One Diaper - Hook and Loop closure. Made in USA. 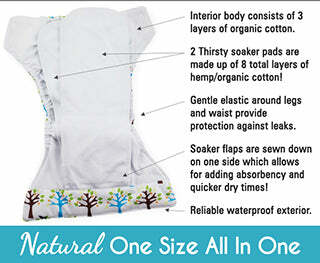 Order 6 or more total of any closure of the Thirsties Natural AIO and save 5%. Add them to your cart to see the savings in your cart. The snap closure version of this is here. The Newborn hook and loop version is here. The elastic is so soft and stretchy and the design is great and the "feel" of it is just right. This soft, easy-to-use cloth diaper includes 11 thirsty layers of natural fibers: 3 layers of organic cotton in the body and 2 soaker pads with 8 layers of the same hemp/organic cotton. As with all "one-size" items, they are really quite huge on brand new babies. I like them (all kinds of one-size things) starting after the newborn time, perhaps 11 pounds and up. Made in USA. Prewash on warm. Wash on hot. Add another rinse on warm. Hang to dry or dry in the dryer on low. Peony, Foxy, Flutter By, Set Sail, and Hala Kahiki are limited edition. I am Nana/Grandama love the diaper and the velcro, but the dry time is a nightmare. Diaper is nice and trim and Velcro is nice but only has 2 sewn in inserts that are very thin. I'm in process of trying different fold methods with them but have been successful without leaks by adding a small hemp pad thus it isn't an AIO for me. Dry time is longer for this diaper than others I have because it stays wet in the area where all pads are sewn in at the front. I wouldn't buy this again as it is expensive and I still need extra inserts. My girl is 20lbs and 9 months old. These fit my LO great, she has thinner legs so thats a big plus! and the velcro closure makes it so easy to put on. We use these on our 14 lb two-month-old now that the newborn ones aren’t absorbent enough, and they fit him very well with room to grow. The elastic around the legs is great for holding in his newborn poo, but it is really difficult to get clean, because it will get into the folds of the elastic. Quite a few pairs have had to go right back in the wash, which is pretty frustrating. It’s really made me prefer prefolds with covers, but we have these to make it easier for caregivers unfamiliar with cloth. I think these are just one of the best diapers ever! In my top three for sure. Love gifting these to my friends. The hook and loop is excellent. The absorbance is outstanding and very little prep required. Love the 100% organic cotton. 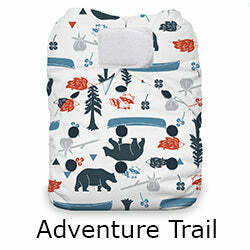 Natural fibers are the best, imo, because they clean so well which means no stink issues, and healthy baby bum. Super cute prints too.